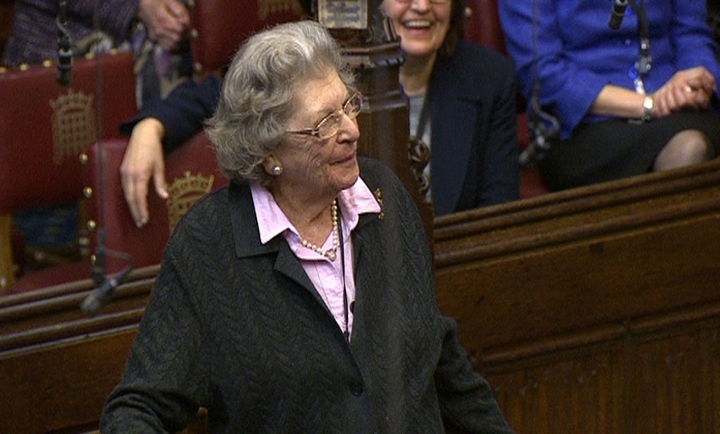 LONDON — British socialite, codebreaker, politician and bon vivant Jean Baker — better known by her title, Baroness Trumpington — has died. She was 96. Son Adam Baker says she died Monday in her sleep. Born into a wealthy family, Baker served in naval intelligence at the Bletchley Park codebreaking center during World War II. She later became mayor of Cambridge and entered the House of Lords in 1980. She served as a whip and minister in 1980s and 90s Conservative governments. She became a media star in 2011 after making a rude gesture in the House of Lords at a member who had referred to her age. Former Prime Minister David Cameron tweeted Tuesday that "she was one of a kind — they simply don't make politicians like that anymore."